I can’t believe it’s been a year since my little chunk was born. 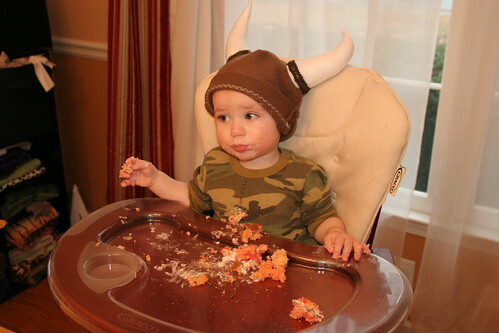 We celebrated his birthday yesterday, Viking style. I made Viking helmets, of course. Each child also got a plush dragon (I asked for colors ahead of time so there was no “but I wanted the RED ONE” angst to deal with). I heavily modified a pattern I found online, and it was really my first time making up a plush pattern as I went along. I think they turned out pretty good. 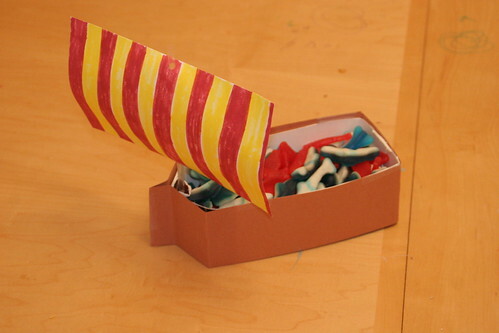 I made a small Viking ship out of half a milk carton, a straw and some paper. I filled it with Swedish fish and gummy sharks. I made a big Viking ship out of a cardboard box and filled it with Erik and his guests. Hee. The cake was just a white cake with red food coloring swirled in (Jake decorated the top with mounds of sprinkles). I had planned to make a dragon shaped cake, but got a migraine the night before which put a halt to that plan. In any case, it was enjoyed. It was a lot of fun, and I wasn’t up until 4am making anything which is always good. 🙂 Now I get back to working on taxes, which haven’t been too bad this year. I’ll give an update later this week on Bewhiskered’s charitable contribution and announce the charity for 2012. 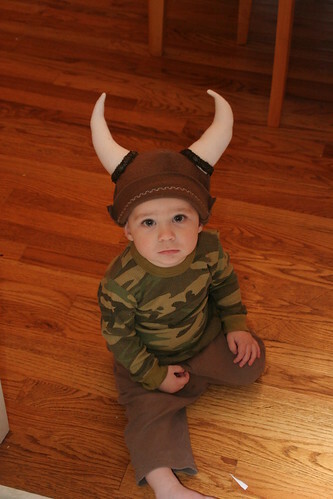 Such cute Viking hats! 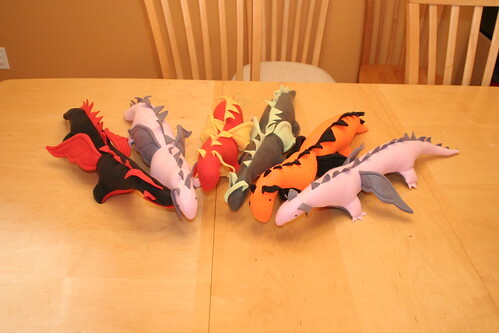 Gotta love the dragon plushies too! That looks AWESOME, Kenzie!! I hate that we missed it, but my little germ-sponges keep soaking up ick. We’re getting Linnie tubes on Feb 3rd, so hopefully we’re moving toward normal. We missed you, but I totally understand. Jake and I are still fighting the sniffles. Jason had tubes as a kid and says they helped him greatly. Here’s hoping they do the same for Linnie! What a fantastic party! I can’t believe it’s been a year either! Thanks! Time goes so fast when you have little ones. It’s frightening really.